As film cameras begin to go the way of other useless antiques, it can only become more popular to talk about them as objets d'art. We often talk about beautiful cameras (for me, the twin champs are the Leica M3 and the 5x7 Deardorff), but, as everybody knows, ugly cameras take better pictures. Anybody have any candidates for World's Ugliest Camera? One of the most inspiredly ugly cameras I ever saw was a point-and-shoot called the Konica Cyborg, but unfortunately I can't seem to find a picture of it online. Of course, almost all disposables are about as charmless as can be, certain Russian Leica copies are inherently hideous, and I might mention that the late, lamented Minolta had some pretty bad years in there. The Graflex 3A "Automatic" (above) has to be up there. Anybody got any favorite ugly ducklings? It later became the Koni-Omega, which lacked some of the funky style of the original. Still you gotta love a camera with (count 'em) three cold shoes on top of the camera. My vote would have to be with the Zeiss Ikon Contarex Cyclops - the camera which managed to destroy Zeiss. How about the FED 5 Soviet Rangefinder, Mike? That's a pretty ugly beast if you ask me. My vote goes to the Simmon Brothers Omega 120. A strange beast, although not without a certain technical charme. And capable of good results BTW. But ugly it certainly is. What about a Top Ten of the worlds ugliest cameras when you´re done with the favorite photos? Just for curiosities sake.And I´ve seen enough of these "Most Beautiful Leica" polls. Here's a real beaut. The lovely Imperial Mark XII. I think it gives the Graflex 3A a good run for its money. My first "real" camera, the Argus C3, aka the "Brick" was pretty ugly. AHHHH... One of my specialties, Mike. I have many of these adorable ugly ducklings. I'll have to shoot a few when I get home tonite and send them to you. This could be a lot of fun. Perhaps a new blog page should be set up for entries?? Anyone else game ??? This is Fed 2 and Fed 3. Dear Lord, I'd never seen that Simmon Brothers Omega 120 before. That is TRULY ugly! The World's Ugliest Camera?? I think that's can be my one, scrached, damadged, but still alive, C-220 ZOOM by Olympus, lol. But seriously, the ugliest camera i think is an cell phone camera... Sorry for bugs in the text, but i still learning english :D.
Don't forget the Kodak 35. If OSHA had existed then Kodak would have had to put guards on the front. Beauty may be only skin deep but ugliness is forever. :) Nice one. World is full of strange, bad looking cameras. Do you know Lubitel camera, Mike? 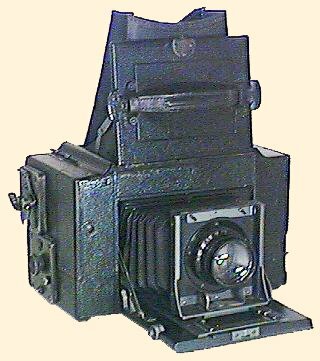 A Univex Mercury is a camera that was unorthodox in both design and appearance. It had a disk shutter that required a large casting on the top of the camera to house it. This gets my vote for being particularly ugly. Oh, I feel so blue...someone listed my old Argus C-3 as ugly...well,yes, its proportions with its little 3.5 lens was a bit odd and the block that was the casting of urea formaldehyde was black and heavy but the camera in spite of incredible poor maintenance worked. I got it when I was 15 and it was covered in blue mould from being left in a Fla. garage for twenty years or so. I took it apart, cleaned it learned how to lubricate it, even took the lens elements apart to get the mould out of even that area. LO! After all of this, the camera worked perfectly and I used it for years until I could afford a modern circa 1959 Petri Rangefinder...Ever hear of that one? Lots of slick cameras have come along but the old C3 is my favourite ugly duckling. I learned photography with it so it has a place in my heart for ugly but lovely. I'm amazed nobody mentioned the tremendously ugly Olympus SLRs from the eighties. One example: OM707. The Minolta is a beauty compared to it. Also, it seems Oly got nostalgic and decided to use similarly beauty designs in their recent DSLRs. Man, that Simmon Omega looks like it should be called the Winchester Mystery Camera. They couldn't stop building onto it.